The main reason why I started The How-To Gal was because I love beautifying things that others have discarded. I wasn't professionally taught how to do any of the tutorials that I post on this blog-it's just me trying to figure it out on my own. Whenever I get stuck, I turn to the trusty Internet to help me solve the problem step-by-step. I wanted to be a help to others. Today's blog post is a tribute to just that- helping others. Brianna contacted me a few months ago with a picture of a glider her husband had purchased online for $10. It looked pretty beat up, but I knew there was potential and so did Brianna. I emailed some suggestion of what to do with it, and below is Brianna's story! "We started off trying to assess how usable the cushioning was for either the chair or the ottoman. The fabric was very badly stained and worn, so we knew we wanted to replace that. When we took the fabric off the ottoman, we discovered that the padding was basically disintegrating. So, we removed the padding and fabric from the ottoman and the cushions from the chair and went to work painting the frame of the chair. I picked out a dark, chocolate brown color, and we finished it with a semi-gloss finish spray to seal it. It took some time to paint everything because I was getting further along in my pregnancy and didn't have as much mobility as usual. We finished the frame of the chair and ottoman, but still hadn't decided what to do with the cushions. My sister helped me look for upholstery fabric and some padding that wasn't too expensive, which we found at Joann's. I knew I wanted to go with something in a red shade, and we found a fabric that has red and cream/yellow checkers that I liked, and it accented the brown very well. We used the cushions to create patterns on the fabric and the padding, and cut them out - the fabric we cut with a 1/4" seam allowance, and we used 2" padding for the back, seat, and ottoman. We sewed the fabric pieces together on three sides, slipped them over the padding, and hand sewed the bottom shut. 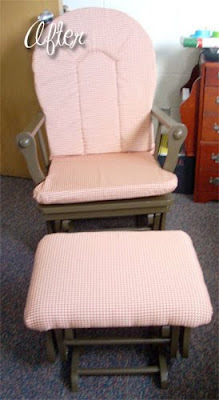 There were also two pieces on each cushion that had velcro on them to attach it to the chair. The back cushion originally had an inset curve sewn into it, which we replicated with some thick cream-colored embroidery floss by hand. On the ottoman, we just laid out the fabric, padding, and ottoman upside down on a table and used a staple gun to attach the fabric to the ottoman. 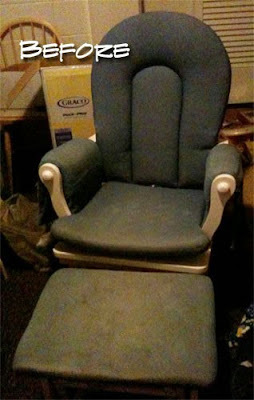 All in all, the cost of re-doing this chair was around $130 total for the paint, gloss, fabric, and padding. I am so happy with how this turned out, and I appreciate your help and inspiration!" Brianna, I am so glad you are happy with it! I think this story is a GREAT example that through creative means and a little elbow grease, anything can be beautified. 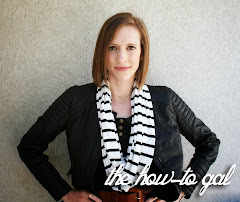 Do you have a similar story you would like featured on The How-To Gal? Email me your story with before and after pictures! You need to come to my house and spend two weeks making things pretty! I love it!